I read this fascinating novel for the Africa Reading Challenge hosted by Kinna Reads: Elechi Amadi is a notable Nigerian author who writes in English. The Concubine (1966) is one of his five novels, the others being The Great Ponds, The Slave, Isiburu and Estrangement. According to Wikpedia, ‘Amadi’s novels are generally about African village life, customs, beliefs and religious practices, as they were before contact with the Western world’ and this is certainly true of The Concubine. There is no mention of any western influences or events, and the novel has a timeless quality. The rhythms of village life seem eternal, and the routines immutable. Characters have speech patterns that reflect (presumably) old ways of thinking and talking, and they use greetings that seem charming, such as the call and response used when parting at evening: ‘May the day break/May it break’. Before long the reader is captivated by this tale of doomed love. A beautiful young woman, Ihuoma, is suddenly widowed by the accidental death of her husband, and though his death is attributed by the villagers to a fight he had with a rival, Amadi hints that some supernatural force is at work. This doesn’t deter Ekwueme, who falls passionately in love with Ihuoma, though until now he’s been in no hurry to marry. But fate steps in: he’s been betrothed since childhood to Ahurole, and such are the traditions of his village that it will cause a major scandal if he doesn’t go through with it. But the marriage is a disaster. Ahurole doesn’t match up to Ekwueme’s preference for the maternal type, and she’s weepy and wilful. She sulks and she nags, with the inevitable result in a society where males may ‘chastise’ women who ‘deserve it’. When jealousy of Ihuoma rears its ugly head, Ahurole seeks a love potion to bring Ekwueme back, but the results are not what she expected. A medicine-man (dibia) is like anybody else in business, and they’re not all reputable or trustworthy. What made this book so interesting for me was the way it challenged my western feminist view of gender relations. The Concubine is almost biblical in the way it portrays women, who are either eerily deferential to their men as Adaku, Ekwueme’s mother is, or tiresome harridans as Ahurole is. Ihuoma becomes a prisoner of the gracious, ‘well-behaved’ persona she has created for herself in her widowhood, and Wigwe, Ekwueme’s father is grave, dignified, and always lord in his own home, even though he doesn’t always know best. But male dignity is undercut by the representation of the young men of the village, who often seem to act more like adolescents than men in their thirties. This is especially true of Ekwueme who defers leaving the parental home as long as possible, makes no secret of the fact that he prefers his mother’s cooking, squabbles with Ahurole over trivia and sulks in his room by himself rather than try to patch up his marriage. Having finished the book, I am still not sure if Amadi is satirising this state of affairs and the spiritual beliefs of the villagers, or indulging in nostalgia for the traditional pre-colonial lifestyle. I wonder what contemporary young Nigerian women think of it! A very fine review. I read the Concubine a long time ago and the issues discussed here have been recaptured for me in a poignant manner. Thank you. I know just what you mean about the pleasure of ‘recapturing’ a book that you read a while ago. Fine books stay with us for a long time, and now that we find reviews cropping up all over the web, it’s like meeting up again with old friends that we hadn’t expected to see again. Thanks. Your review has me ready to find and read this book. but I was unclear by what you meant when you said that it “challenged my western feminist view of gender relations”? What I meant was that if I judge the author as needing a good dose of Feminism 101 – am I failing to respect their culture and imposing my western values on his book? Yes. I know that dilemma. Recently, however, I have been reading women writers who take a different position. As global feminists, they attack both their traditional societies and western colonizers as being unfair to woman. They also see western feminists as anti-Muslim and are trying to build an alternative that respects their traditions while ensuring women have positive roles. They fear Islamic leaders who trying to reestablish strict control over women. I discuss these views in my blog reviews of books like Women and Gender and Border Passage by Amed, Changes by Aidoo, and Arab Feminism. It is also present in the book I am reading now, Unfinished Revolution. Yes, it is tricky, and in this case, I don’t think it’s resolved for issues arising from classic literature by reading contemporary authors who are exploring alternatives, interesting as they are. When I read C19th lit (e.g. I am reading Resurrection by Tolstoy at the moment) I resolve any tensions about the way women are presented by placing the author as a ‘man of his time’. (I’ve read enough C19th Lit to know when an author is out-of-step with his time, or not). But this author is a man of the 1960s when change was in the air, yet also a man of the post-colonial period when it was important to celebrate an independent cultural identity. Amadi is one of the great writers of Nigeria, but I really can’t tell from this book whether he was one of those blokes resisting feminist winds of change, whether he just didn’t know about them, or whether his other cultural concerns over-rode them. There’s very little about his writing on the web at the moment, but I’m sure that before long there will be reviews of his other later books, and perhaps that will resolve my curiosity. I’m also on the lookout for African women writers of this period, but of course it’s not easy to get my hands on them here in Australia. Excellent points. I found articles comparing Flora Nwapa’s Efuru and Elechi Amadi’s The Concubine in an online data base from Contemporary Literary Criticism. Both authors were in the first wave of writers after independence when feminism wasn’t an issue yet. The author claims Nwapa treated the women in her book with more attention and respect, portraying them as more fully human than Amadi does. I’d say the same is also true of Emechetta, who clearly identified the pain of traditional life for women and was writing slightly later. Or even Adichie who is contemporary. Not having read Amadi, I’d guess that he, like many traditional male writers everywhere, was not fully aware of women. I’d be glad to email you an article if you could give me your address. Our local college library is small, but it does give me access to databases and full-text articles. I’ve followed your comments with interest and I dare say that I doubt if Amadi was not fully aware of issues of feminism or of women during his time. Ihuoma in the Concubine is treated with respect by her elders and comtemporaries alike. Ahurole is also presented as a quarrelsome woman, both of these characters are found in any given society. I believe what Amadi does is to use these women to portray relatiionships, love and marriage in the traditional african setting; a sort of love brewed in the African pot. I do see The Concubine as a love story gone bad, with all the elements of a traditional African beliefs. In so doing, Amadi gives us glimpses of Nigerian society in pre-colonial times, the structures, norms, beliefs and values that inform their day to day living.. I must say, Celestine, that the more I think about this book the more I liked it. I just loved the rhythm in the way the characters talk to one another. And yes, while it’s distinctively African, I think that kind of love story is also universal. Spot on,Stu, I’ve had two from this series and they’ve both been great! one of my interesting novel albeit left me sad with its end. Hello Ado Shaibu, and thank you for sharing your thoughts here:). Just as Lisa said The concubine is more or less like a tale of doomed love.. A girl knowing nothing about her background i.e she is the wife to the Sea-king.. Because of this she cant get too close to a man.For every man she gets close to.. The man always finds himself in quite a fix.. First Emenike then Madume.. N tragicly Ekwueme:(. One of the things I find most fascinating about African literature is the similarities and differences between the role of women in Australia and in Africa. In both countries strong women make a difference, but in traditional African societies, that strength is expressed in different ways. Thanks ever so much for this wonderful novel. Frankly speaking, this is one of my best. African writers are very creative, oh yes, they are. We expect alot from as time goes. Thank you very much for this nice production. Hello Karmo, and welcome:) I hope to read more of this author one day soon. I really appreciated with THE CONCUBINE. Hello Sabiti, yes, the plot has elements which may be attributed to the supernatural, or be considered superstitious. I would need to re-read the book to discuss these elements and the author’s purpose in using them because it’s a long time since I read it. Hello every one. Can someone help me and give me a full description of all characters in The Concubine? Hmm, I recommend that you read the book, and make a note of the characters as you go. Amazing and encouraging as it is talking of African cultural morals.. The novel the concubine is a interesting novel which i really enjoy reading also full with moral lesson, talk about only traditional way, how our culture should be follow and take care. Some moral lesson which i pick out was Ihuoma, how she humble her self, be polite and keep away from quarrel insert she will been the one reconcile with the woman to avoid conflict between the two woman, her respect was all over village she was also she was most beautiful young lady in omakachi. Another moral lesson was how the wife in the village respect their husband and never upset or keep them away from their meal or private people like Adaku wigwe wife, wolu madume wife the big Eye, ihuoma the her neighbour wife etc madume the big eye which the village give him as a nickname which mean that he was never satified with whatever he has in the process of his big eye. the result he gave was die. Yes, I think you are right, this novel could be a kind of moral lesson, because it shows women who respect their men, be humble towards them and serve them. And there are still plenty of men who think like this and expect women to do as they say, even when they are foolish like Big Eye. But this traditional way is not how we live here in Australia and many other places round the world, where men and women are equal. So I think this novel could be a useful book in places that are changing, where people are asking is this traditional way fair? I am shocked by the death of Elechi Amadi the author of ‘The Concubine’. This is one book that made me love literature to date. The characters e.g Ihuoma, Emenike, Ekweme, Ahurore, Wodu Wakiri -the wag, Agoturube the dibia, Madume are real characters in the world. I read it back in 1982 and the story is still very life in me. That is indeed sad news. Thank you for letting us know about it. 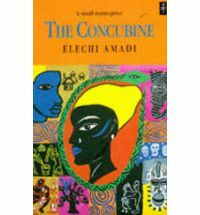 i love this novel so much the book that brought me to the literature family i love ‘the concubine’ i the Elechi Amadi’s book Literature is first in the world and will always rule the world.